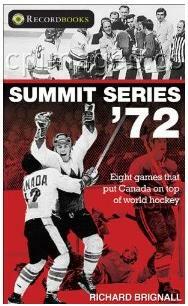 Publisher James Lorimer and Company and author Richard Brignall bring us Summit Series '72: Eight Games That Put Canada On Top of World Hockey . Like all books in the RecordBooks series, this is a quick, easy read. It is brief and does not offer anything new on the much written about Summit Series, but it is a good introduction for new generations of fans looking to learn about one of hockey's most important events. Here's more from the publisher: It wasn't until Canadian teams started losing in international tournaments in the mid 1950s that an epic hockey rivalry between Canada and the Soviet Union began. Canadians believed hockey was "their game." So Canadians were in for a rude awakening when they lost Game One of the 1972 Summit Series to the Soviets. The eight-game tournament quickly became a "war on ice" fuelled by competing Cold War ideologies. Hockey fans will enjoy reading about: small-town teams that represented Canada in international tournaments before there was a Team Canada; Father David Bauer and the first National Hockey Team; the birth of Hockey Canada; Canada and the Cold War; Canadian style of play in hockey versus the Russian style of play; and Bobby Clarke's dirty slash on Kharlamov. About the Author: Writer and former sports reporter Richard Brignall lives in Kenora, Ontario. He is the author of several other titles in the Recordbooks series, including Fearless, Big Train, Forever Champions, Big League Dreams, and China Clipper. His also a frequent contributor to Cottage Life and Outdoor Canada.